If you look at the “History” page on the BMIMC website you’ll see that in 1982 “an American friend called Joseph Goldstein was invited to lead two retreats in May & June”. These retreats were held at Wat Buddha Dhamma near Wisemans Ferry and at Bodhi Farm near Lismore. At the time, some of the participants probably viewed these retreats as part of the hippy counterculture movement. However, from the perspective of 2018, they can be seen as marking the beginning of a lineage transmission of the Buddha’s teachings to Australia. The interest generated from these two meditation retreats resulted in further retreats being organised and created a momentum that ultimately led to the establishment of a permanent teaching centre in Medlow Bath. It is important to recognise that the history of the Buddha’s teachings is one of transmission from teacher to students – a history that dates back to the time of the Buddha over 2,500 years ago. The Buddha did not present his teachings as a complete unified doctrine that had to be accepted as absolute truth. His approach was to respond to questions in a way that was meaningful to his audience. This meant that over time, a body of teachings (discourses) developed that was both diverse and adaptable to a variety of situations. As a result, the teachings have been able to continue to adapt and remain relevant to the ever changing environments in which they operate. This is particularly important when the teachings are introduced to a different language or cultural group – as is the case with the teachings coming to Australia. Related to this process of personal transmission from teacher to student, is its interaction with the historical discourses of the Buddha. Since the time of the Buddha, various versions of his teaching (known as the Dhamma-Vinaya or Buddha Dhamma) have been passed from generation to generation. The Theravada tradition is grounded in the discourses recorded in the Pali Canon, which are commonly recognised as the oldest surviving records of the Buddha’s teaching. Traditionally monks in the Theravada tradition have memorised significant portions of the Pali discourses and used these as a reference to ensure that what they taught was consistent with the tradition. Although oral transmission of the discourses may seem unreliable to us, it was regarded as a very effective method of preserving the integrity of the texts long after written forms were made. This is because recitation of the texts was done in groups and hence any individual’s mistake would be picked up and corrected. The teachings offered at BMIMC form part of this Theravada tradition and are in the lineage of a Burmese monk widely known as Mahasi Sayadaw. The Mahasi lineage can be traced to Burma in the 1940-50s. Around this time Burma gained its independence from Great Britain and there was a surge in interest in Buddhism as the national religion. The new Burmese government promoted this interest and encouraged the practice of meditation by lay people. In this environment two teachers stood out – a layman called U Ba Khin who was the first Accountant General (equivalent to the Treasurer) of the Union of Burma and the highly respected monk Mahasi Sayadaw. Both of these lineages have become influential in Western countries. The meditation teachings offered by U Ba Khin are taught today at hundreds of centres around the world as “Vipassana Meditation as taught by S. N. Goenka in the tradition of Sayagyi U Ba Khin”. The meditation teachings offered by Mahasi Sayadaw have also been adopted in many Western countries and are the lineage on which BMIMC was founded and which continues to evolve. The Mahasi lineage has been taught in Australia by monks, nuns and lay teachers. The following tables show some of the most significant monastic and lay teachers who have brought this lineage of teaching to Australia. All of the following teachers (other than Mahasi Sayadaw) have taught retreats at BMIMC or at a venue organised by the BMIMC. 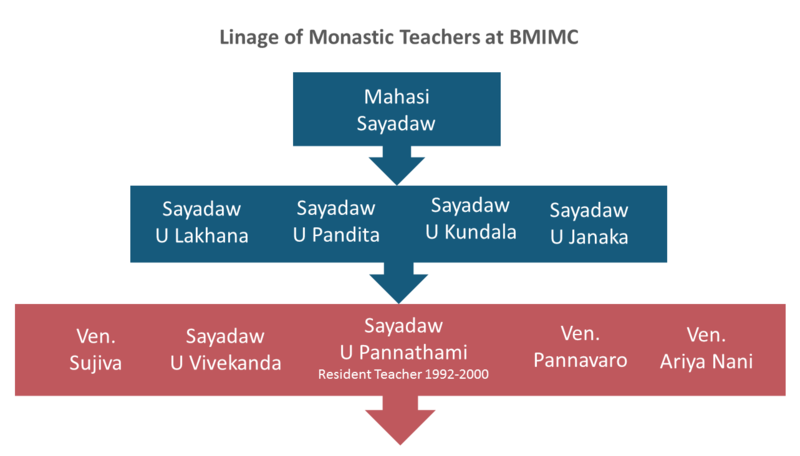 The following lay teachers have been significant in the development of BMIMC and all of them have studied under at least one of the monastic teachers that followed Mahasi Sayadaw – mostly with Sayadaw U Pandita (Joseph also studied under Mahasi Sayadaw and was authorised to teach by him).Most of these lay teachers have also studied and practised in other traditions including the Thai Forest, Zen and Tibetan. This makes their teachings a more diverse mix and may mark the beginnings of a new lineage should a lay teacher tradition become established in the West. 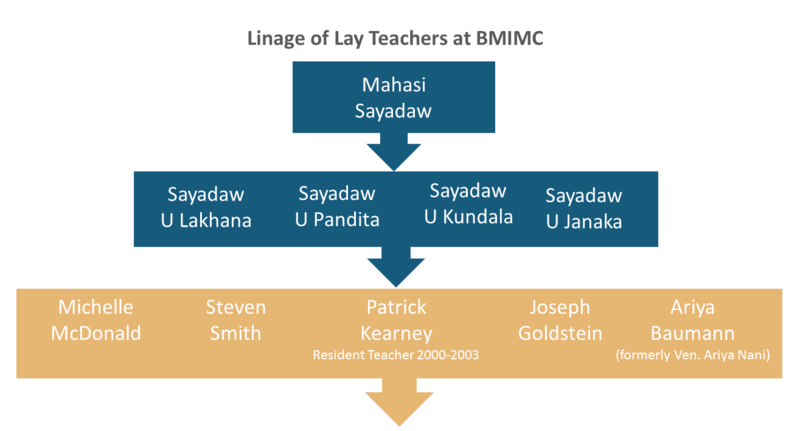 Lineage of Lay Teachers at BMIMC. Grahame White & Lynne Bousfield played a very important role, as they were primarily responsible for organising all of the early retreats including those by Sayadaws U Pandita, U Lakkhana, U Pannathami, U Kundala, Joseph Goldstein, Alan Clements, Sharon Salzberg, Steven Smith & Michelle McDonald. Other significant foundation supporters were Tara Frances, John & Sheila Hale, Elizabeth Gorski (now Sister Nirodha), Patrick Kearney, Malcolm McClintock, Chris MacLachlan, Viveanne McClintock and members of the Sydney Burmese community including U Aung Kyi & family, Henry Chan, Alfred & Brenda Myatt, Daw Pyone, Ko Ko Latt, Roger & Khin Khin Myint and Dr Kay Wain. From the early days onward there’ve been many other people who have volunteered to cook, manage, clean, shop, raise funds and do all of the countless other tasks associated with running a retreat and a meditation centre. To all of you – Sadhu, Sadhu, Sadhu! Sayadaw – is a Burmese word used to refer to a senior monk or abbot. Mahasi Sayadaw – is the name usually used to refer to U Sobhana and comes from the name of a monastery where he was residing that was famous for having a big drum – which in Burmese is called a “Maha Si”. U – is a Burmese honorific used to indicated seniority. Ven. – is an abbreviation of “Venerable”. Sadhu – means well done or well said and traditionally is chanted three times after a dhamma talk. BMIMC has primarily relied on visiting teachers since 2003.